Made from fibreglass, it is both light and maintainance-free. Standard size, fits a wide range of boat sizes whilst still leaving room to get around them on the pontoon. We also offer tailoring, such as small doors for stowage, alternative colours, treads, and stainless steel handrails. We can also include your boat name on the steps. 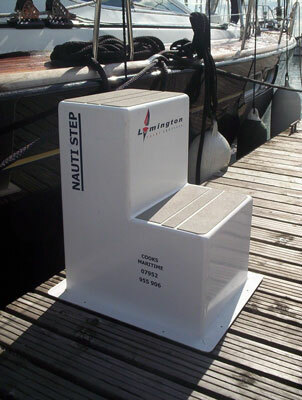 Prices start from £120 for standard size steps showing your boat's name. For further information and ordering of the Nautistep, please contact Vincent at Cooks Maritime Craftsmen on 07952 955906 or 01590 675521 or email cooksmcraftsmen@tiscali.co.uk.